One lot remaining from 7 recently subdivide titled lots, located 100 meters from the quiet secluded, beach at the south side of Playa Junquillal, Guanacaste, Costa Rica. This is approximately 45 minutes from Santa Cruz, and 45 minutes south of Tamarindo on a dead-end public road with little traffic. 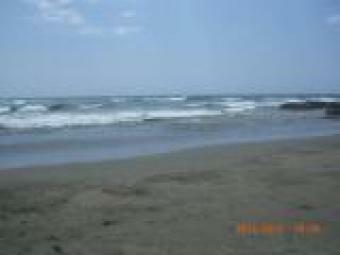 1 � hour from the International Airport and the Main town Liberia. The lot measures 2085 square meters in size and has a private entrance off the main public road, which has municipal water, power and phone service along it. There is another private road at the back of the lot, which already provides a second beach access from this lot. Although this is not `oceanfront property` you can`t get much closer to the beach, and a view of the ocean can be seen from the front yard. The water supply is provided by the Paraiso Aquaduct Association, which gets pure water from deep rock wells and maintains the distribution system to Paraiso and Playa Junquillal. Water supply is not an issue in this area. The sale price includes the shares of the newly formed Costa Rican Company, that owns the titled Lot (2085 square meters). Further information on the company and property are available upon request. A private oasis along a secluded stretch of sandy beach (with a few interesting rock outcroppings) where you can walk for miles to the south without meeting other people. Within the Town of Paraiso and Playa Junquillal area there are several excellent restaurants and a few small resort hotels and supermarket. A nearby river estuary is home to exotic birds and wildlife, and along with the waters off-shore, provide world-class fishing.